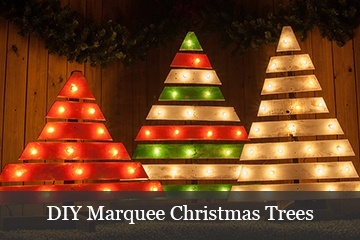 Charming and attractive, DIY marquee lights are a must-make decoration for your outdoor Christmas display! Marquee signs date back to the 1930s and were commonly referred to as "electric tiaras" due to their flashy colors and bright lights. During World War II standard building materials were limited, but glass and lighting were readily available. Once the idea was born, the marquee quickly gained popularity with movie theater architects as a lightweight and cheap way to attract customers by grabbing their attention. Over the years the marquee sign has continued to grow in popularity. Marquee signs are now the centerpiece of some of the most iconic locations and images in the world. Just try to imagine Times Square or the Vegas Strip without their famous marquee signs. 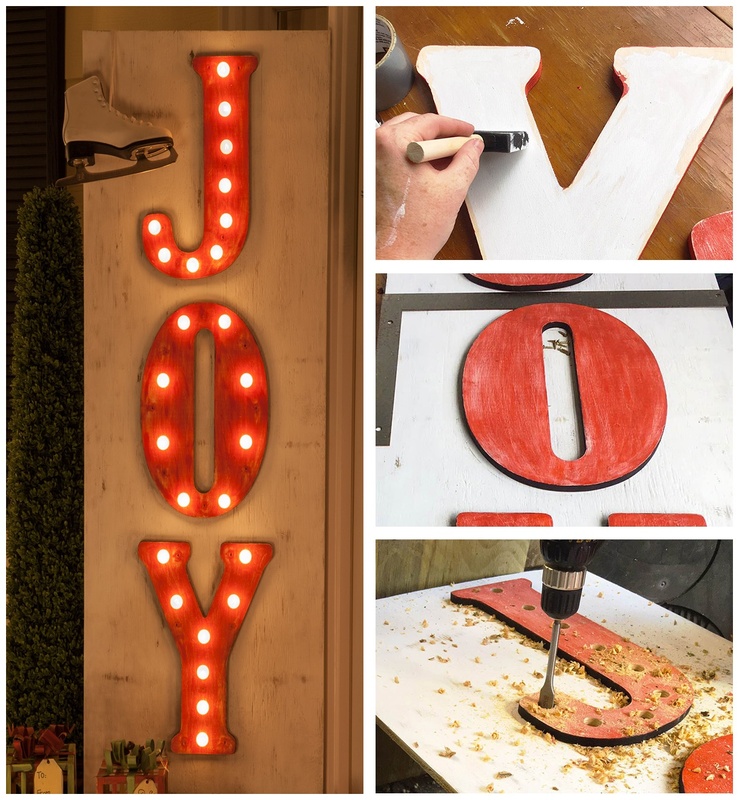 This unique JOY marquee sign project lets you build your own outdoor attraction making it a must have for the holidays. 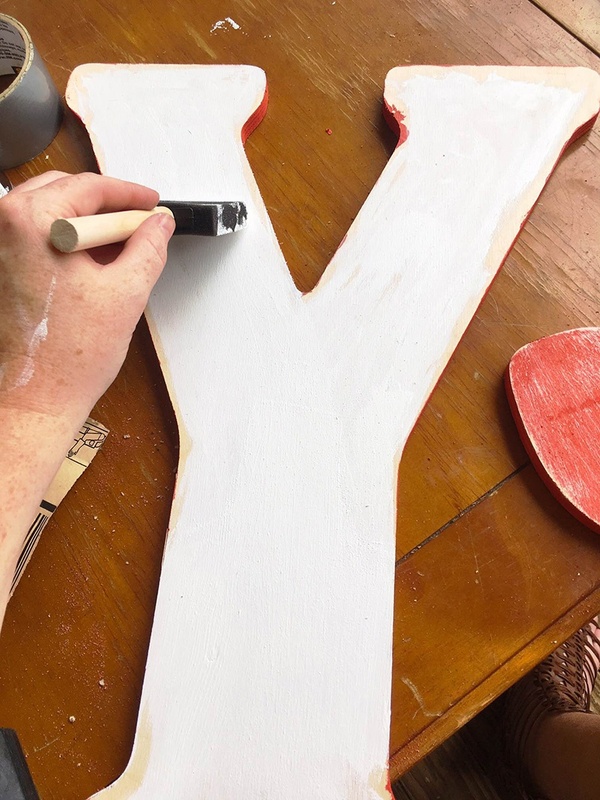 You can make a DIY marquee sign with any words you like, but for this project we're using a popular word that is synonymous with Christmas...JOY. 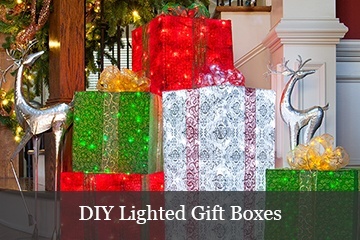 A couple of inexpensive materials (less than $50!) and a few hours of work are all you need to have an amazing vintage style marquee sign! 18" unfinished wood letters to spell out "JOY"
In the lumber department select a sheet of pressure treated 4' x 8' plywood at least 1/2" thick. Have an employee saw the board into two pieces, which will give you two 2'x 8' sheets of wood. Then, have them cut 2'off of each to leave you with a couple of 2'x6' sheets. This only takes a minute to do, which saves you time and it's easier to put in your vehicle! 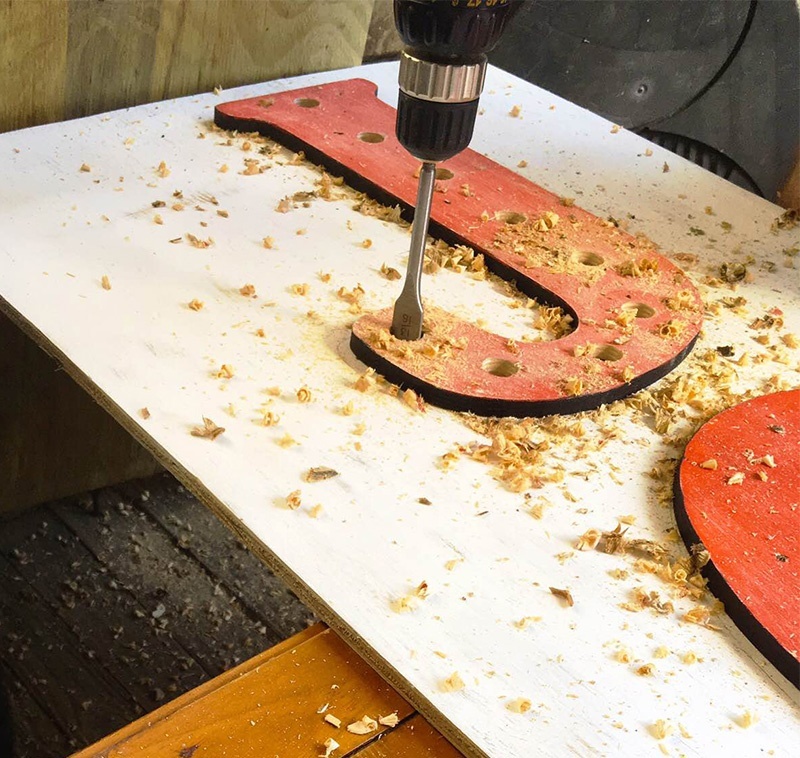 Your local craft stores are a great place to find wood letters. They usually come in a variety of sizes and styles. 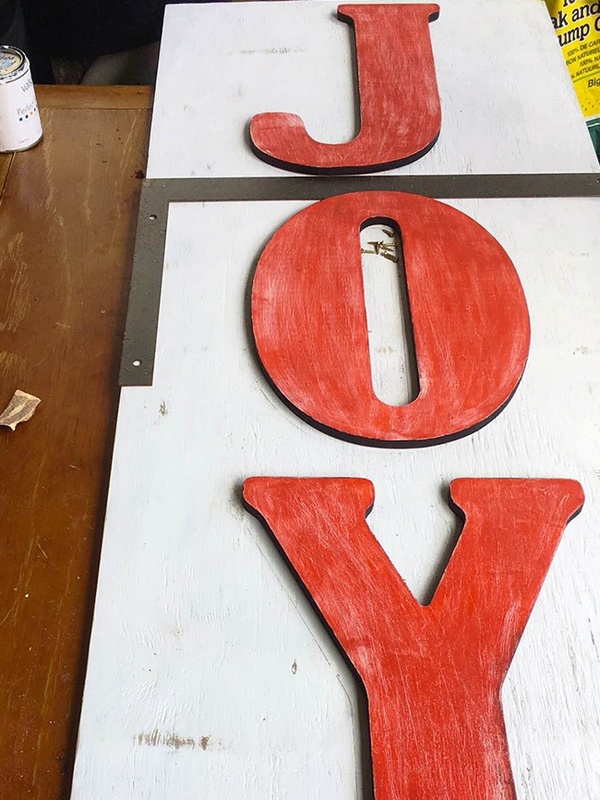 To make our Joy marquee sign we selected 18" letters. Alternatively, a less expensive option is to make your own stencils using Microsoft Word. Set the page size to 11"x17" and with one letter per page, increase the font size to fill the page and pick out your favorite font. Take the file to any office supply store or printer to be printed on 11"x17" paper, which is extremely inexpensive. For our project we first painted our wood letters white, but you can choose whatever color you like. This is your base coat and will be visible after a little sanding in order to achieve a vintage appearance. After the base coat is dry paint a top coat (we chose red) and let dry. Distress each letter with sandpaper, then wipe with a cloth to remove any dust. Next, paint the sides of the wooden letters black. This enhances a 3D visual effect making the letters stand out resembling a marquee. If using stencil letters, cut them out, align them on the board, tape them down, and trace the outline with a pencil. Next, carefully fill in the letters with white paint. 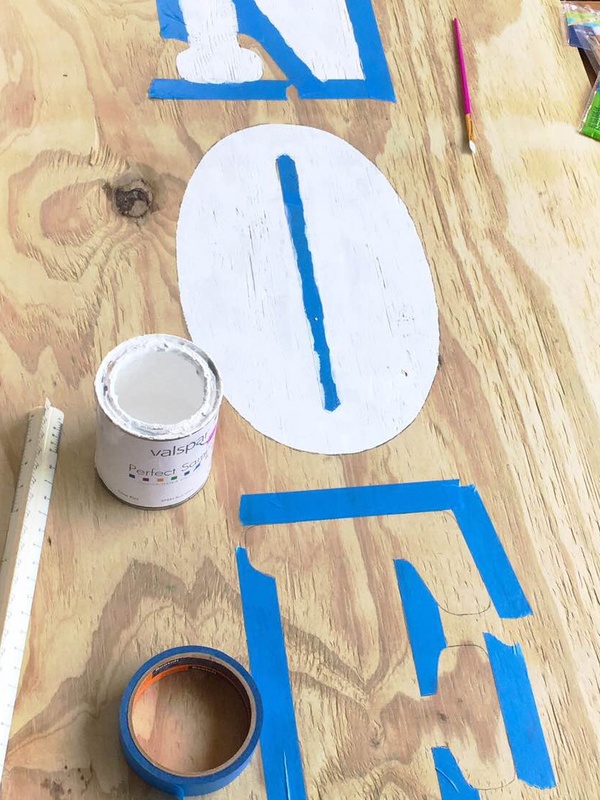 Tip: Use painter's tape to make sure your lines are crisp. Using 100 grit sand paper, give the board a once over to prep it for painting or staining, then wipe with a cloth to remove any dust. Select any color you like to make the background. Once dry, sand as needed to add more distressing. If you are staining the board instead of painting, begin by applying wood conditioner to the background with a foam craft brush. Once the wood conditioner is dry, apply the wood stain with a paint brush. Be careful when staining around the letters and quickly wipe off any excess or drips. Align the letters down the center of your board and use 1/2" to 1" wood screws to drill them into the board. Leave about 2" space between each letter, this will help the lettering stand out from far away. Step 6: Here Come The Lights! 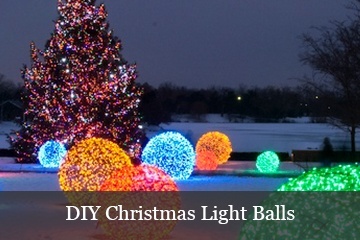 Globe light bulbs are great for a project like this and can be easily installed by selecting the right kind of light stringer that will be on the back of your marquee sign. It works best if you select a stringer that will allow you to use all of the light sockets rather than having to cut and cap your stringer or being left with open sockets that would need to be taped up to prevent water from getting in. For our marquee sign, we used 15 globe light bulbs and a 15 light count stringer which worked perfectly. To begin installing your lights, use a pencil and ruler to make evenly spaced marks on each letter where the lights will go. When you are satisfied with your light pattern, begin drilling holes through each of the marks. These holes are where you will place your sockets. We used light stringers with E12 base sockets for this project and a 13/16" drill bit was a perfect fit! After you have drilled your holes, place the light sockets through the backside of your board starting at the bottom letter first, then screw a bulb into each socket from the front. There are many light bulbs you can choose from for marquee signs, but since we wanted a vintage look with a little style we chose G30 globe bulbs with a pearl finish. This gives the bulbs an opaque pearl white finish during the day and a translucent appearance at night when they're lit up, which looks amazing. Clear G30 globe bulbs can also work well. Once your JOY marquee sign is done you can place it anywhere to create a vignette scene. Doorways and home entrances are popular spots to make a welcoming Christmas scene. Outfit your marquee sign with some surrounding decorations and greenery and it'll put a little "joy" on everyone's face as they walk into your home!